Roscommon booked their place in the FBD League decider. 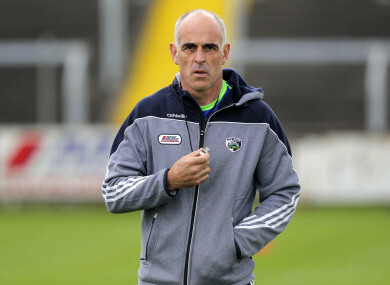 Anthony Cunningham: new boss will prepare for clash with native Galway. ANTHONY CUNNINGHAM’S REIGN as Roscommon manager began with a win as Enda Smith’s goal helped them into the FBD League final with victory over Sligo at Dr Hyde Park. The holders have won this competition on four occasions, and they fought back after they trailed at half-time. Roscommon had 11 different scorers on the day with all three Daly brothers on target. Enda Smith’s second-half goal was decisive. Shane Killoran scored an early Roscommon goal but a stunning 1-6 from Niall Murphy ensured Sligo took a 1-10 to 1-6 interval lead. Sligo had the breeze at their backs in that opening half but Keelan Cawley had to come to the rescue with a goal-line clearance from Cathal Cregg in the third minute. Cregg and Murphy traded points before Roscommon raced into a 1-4 to 0-2 advantage by the 17th minute. Killoran found the net after ten minute when there was indecision in the Sligo defence after a hop ball and he had the simplest of finishes. But Sligo scored 1-7 without reply been the 17th and 32nd minutes. Murphy was an inspiration and he scored the first three points while he slotted home the penalty too. That goal arrived 10 minutes before half-time when Conor O’Malley’s kick-out was off-target, Murphy got through on goal, his shot was stopped on the line by Sean Mullooly and Patrick O’Connor was dragged down from the rebound. Murphy stepped up to slot low to O’Malley’s left and despite two late points from Niall Kilroy and Killoran Sligo held a solid 1-10 to 1-6 lead at half-time. But Roscommon scored an unanswered 1-4 on the resumption. Caoilean Fitzmaurice tied the game up before Enda Smith’s fisted pass was bundled to the net in the 49th minute. Sligo stayed in touch and there was an impact from the bench through the experience of Pat Hughes and Adrian Marren but Roscommon held on with three late points from substitute Colin Compton. Scorers for Roscommon: Enda Smith 1-3 (0-1f), Shane Killoran 1-1, Donie Smith 0-3 (0-1f), Colin Compton 0-3 (0-1f), Niall Kilroy 0-2, Cathal Cregg 0-1 (0-1f), Conor Daly 0-1, Ciaran Lennon 0-1 (0-1f), Ronan Daly 0-1, Caoilean Fitzmaurice 0-1, Niall Daly 0-1. Scorers for Sligo: Niall Murphy 1-8 (0-4f, 1-0 pen), Luke Towey 0-3, Pat Hughes 0-2 (0-2f), Seán Carrabine 0-2 (0-2f), Paul Kilcoyne 0-1. 21. Colin Compton (Strokestown) for Kilroy (63). 22. Alan McLaughlin (St Molaise Gaels) for Towey (66). Email “Anthony Cunningham starts as he means to go on with win over Sligo”. Feedback on “Anthony Cunningham starts as he means to go on with win over Sligo”.